Off the grid accommodation for those who don't want to go completely back to basics. Want to get back to nature without actually having to rough it? 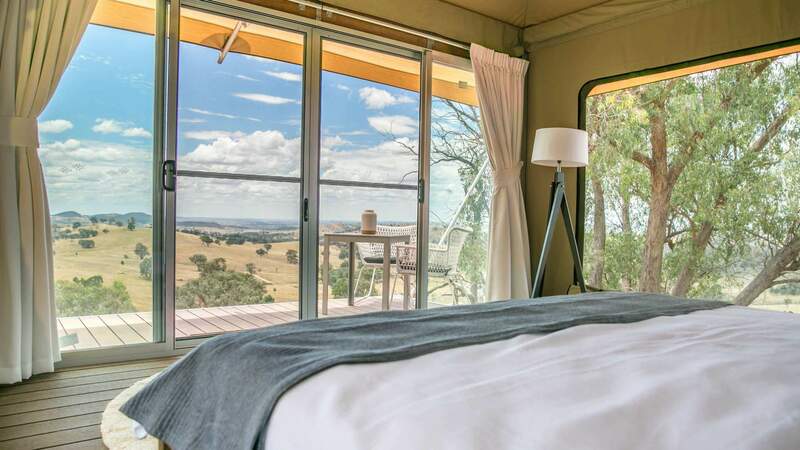 Lucky for you, you can now take in the rolling hills of Mudgee in New South Wales, with the region's first ever luxury glamping service. Now taking guests, Sierra Escape is located 20 minutes drive from Mudgee's town centre, some 260 kilometres north-west of Sydney. The 280-acre property boasts spectacular views and is home to wildlife including kangaroos, deer and a variety of native birds. So yeah, basically it's paradise. The $350 per night tent — if you can even call something this opulent a tent — includes floor-to-ceiling windows, a king-sized bed, a camp stove and fridge, an ethanol fireplace and a separate bathroom complete with freestanding bath, shower and flushing toilet. It's insulated for all seasons, and there's even a deck out front where you can kick back and watch the sunset. "Sierra Escape aims to provide off-the-grid accommodation for those who love the outdoors but still enjoy the comforts of a luxury hotel," said co-owners Cam and Tasch D'Arcy. "Sierra is close to wineries and restaurants, but far enough from it all that it's the perfect retreat. We're excited to share Sierra with visitors to the area and hope their glamping experiences inspire a new way of travelling." For more information visit www.sierraescape.com.au.